There are few moments that we all wish and plan beginning at a very young age. Getting married is definitely one of those moments. Many of us have had our wedding dress, venue, and honeymoon destination picked out from the moment we stepped foot into our mom’s heels. From the moment a woman becomes engaged, it officially becomes wedding planning time. Countless times we will look for inspiration in celebrity weddings, as they tend to render magically beautiful bashes any person would admire. Celebrity weddings tend to be over the top and dreadfully expensive. However, there is always a way to tie in some of your favorite aspects without becoming Sookie St James from Gilmore girls. Here, we have taken the top 10 most expensive weddings of the decade and showed you how to incorporate certain themes into the wedding of your dreams. The Kim Kardashian & Kanye West wedding was more than just a wedding, this couple created an extravaganza. Not only did it take place at the Forte di Belvedere in Florence, Italy, but it was also televised for all to see. The wedding was estimated to be worth $18 million. One things that really caught our attention was the towering flower walls. Kim personally told her wedding planner that she wanted these blooming beauties to be plotted throughout the ceremonial space. Now, not many of us can afford soaring walls of our favorite flowers, but what we love is that Kim took a traditional idea and made it her own. Instead of relying just on a bouquet and a couple of arrangements, she gave her guests a backdrop anyone would want to Instagram. Take the time to think about giving your guests – and yourself – a photo-perfect space that you can all enjoy! 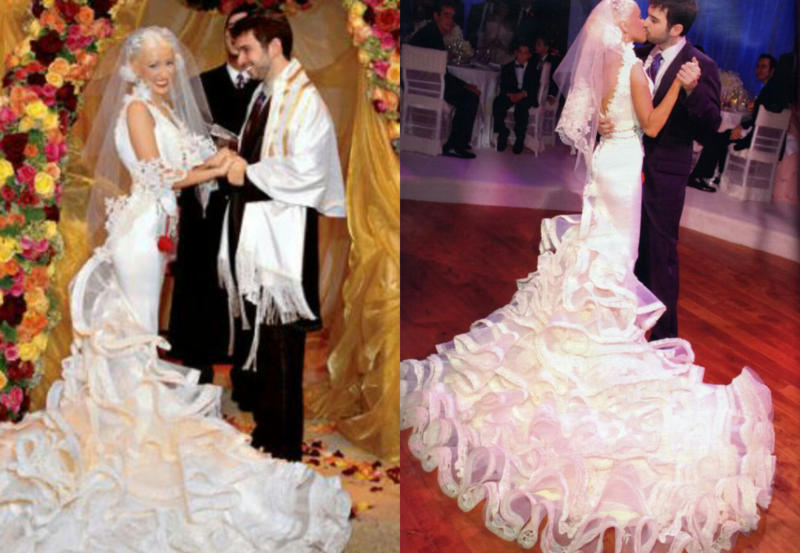 Christina Aguilera & Jordan Bratman’s wedding was calculated to be worth $2.2 million. However, that was not what really caught our attention. What did catch our attention, though, is the way her dress is wildly ruffled at the train. Christina has always been a showstopper, and she did not let the tradition of a wedding confine her creativity. Christina rocked this gown because it was completely her personality. Not only did it create a statement piece, but her womanly confidence was not overtaken even by a dress as intricate as this one. Whether it is ruffles or gems, color or pattern, play up your personal style and turn your isle into the catwalk you have always wanted the opportunity to strut across. George Clooney & Amal Alamuddin’s wedding, estimated to be worth $4.6 million, included a two-day festivity of helicopter and boat rides open exclusively to family and friends. Surprisingly, those extras are not what took our breath away. 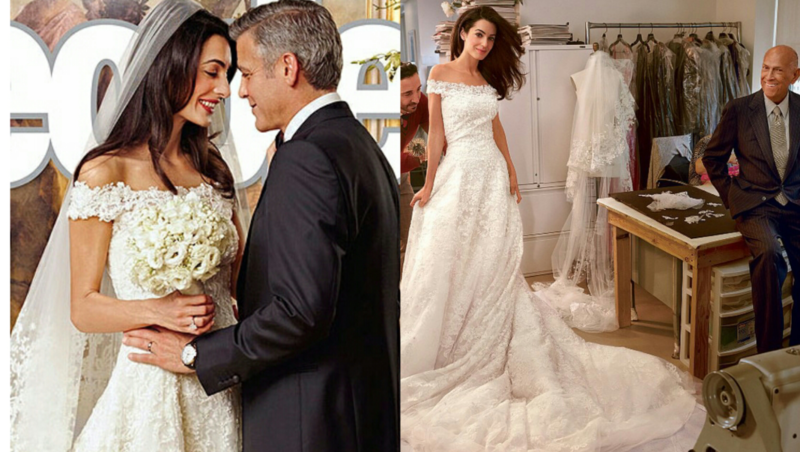 Amal’s custom designed Oscar de la Renta gown made with French Lace is what wowed us. The dress was a delicate and elegant off the shoulder design with just the right amount of lace. While French imported lace and a world renowned designer may be out of reach, spin-offs of both are not. Remember that friend from grade school who was far better at drawing than you? Ask her to sketch while you explain – design a one-of-a-kind piece that only you will wear. Prince William & Kate Middleton’s wedding was calculated to be worth $34 million dollars, which included over 1,900 guests, state carriages, and roles for the foot guards. The wedding was considered a holiday and was viewed by over 34 million people on YouTube. What we loved about this wedding William’s and Kate’s grand arrival in their horse-drawn carriage. We love the concept, as many women would love to include a carriage in their wedding, but we know that regardless of a carriage, the bride’s entrance is a moment no person dares to divert their eyes. So, make yours special, and maybe even include your pouch – we know he is always up for a walk. Elizabeth Hurley & Arun Nayar’s weddings were estimated to be worth $2.6 million dollars. Yes, weddings is correct! They had two weddings: a traditional Anglican wedding in the English Sudeley Castle followed by a week-long celebration in a traditional Hindu ceremony style in Nayar’s hometown of Jodhpur, India. We fell in love with the cultural aspect of their wedding. We adore the idea of including such a beautiful and personal element of a couple’s life into such a significant day. By incorporating you and your partner’s different cultures, you will be creating a more intimate atmosphere for you and your family. Plus, by adding in this more vibrant element, your wedding will become all the more beautiful! Jessica Biel & Justin Timberlake’s wedding was calculated to be worth $6.5 million dollars. It took place at the Borgo Egnazia resort in Puglia, Italy. However, the scenery was not what stole the show. We have included a couple of stuning dresses thus far, but Jessica Biel’s dress has us tickled pink. The dress added color to the entire wedding, making it one of our favorite gowns on the list. We have written about this before, but here it is, a colored gown, experimented with and totally working! Biel stunned not only her new hubby, but all of her guests but moving away from the traditional color schemes and adding a bit of fun into her design. Kim Zolciak & Kroy Biermann’s wedding was calculated to be worth $1 million dollars. Not only did her wedding dresses cost $58,000, but she had three outfit changes and an 11 tier cake worth $11,000. Her dress was gorgeous – yes – but my goodness! Look at that beautiful, rhinestone encrusted white romper. After supporting the weight of a ball gown style dress, there can be nothing more relieving than stepping into your after party free to dance and celebrate. Whether you decide to go with a gown-worthy second outfit or simply change into more comfortable attire, we love the idea of a post-vow, pre-boogie outfit. Tori Spelling & Charlie Shanian’s wedding was calculated to be worth $1 Million dollars. The black tie event was a 1920’s inspired wedding with elements of The Great Gatsby and Old Hollywood tied in. The gowns we have shown you have so far been over-the-top, intricate, or colored, but what we love about this wedding lies in its simplicity. By toning down the dress, in both size and detailing, other elements are given attention. For example, Tori’s veil is stunning; with a shortened length skimming her shoulders, Tori’s face is framed – rightfully so. Bring back the old times, and incorporate this 1920s style into your wedding for simple beauty. Vanisha Mittal & Amit Bhatia’s wedding was calculated to be worth $66 million dollars. It is known as being one of the most expensive weddings Hollywood has ever seen. One of the things that we enjoyed from this wedding was the large red carpet covering the steps of the Palace of Versailles. It was a statement piece that brought the entire wedding theme together. Rather than relying on minor details to bring personality and vibrancy to the wedding, this focal point adds flare with which bundles of flowers or string lights cannot compete. If there is one thing you should take away from this wedding, it is its bold attitude! 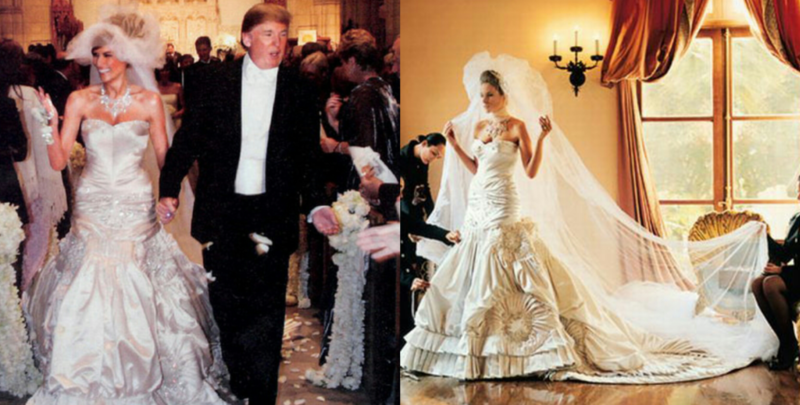 Donald Trump & Melania Knauss’s wedding was calculated to be worth $1 million dollars. Apparently that small loan from his father really went to good use. The dress alone is reason for making our list, a Victorian style ivory gown with embroidering throughout. But, the veil made the dress seem even more put together by adding a little bit of volume and an enduring train. Being shorter in front gave the veil volume, while keeping the back long accentuated the length of the dress. We can take from this wedding the form of the veil and how it went so perfectly with the dress by playing on its features and melting into the look rather than standing alone. These are the 10 most expensive weddings of the decade; however, your wedding does not need to be this expensive to be beautiful. By simply using bits and pieces from these weddings, you will be able to create the perfect for you.